πzza just opened in NoMad and has plans to open a second New York City location in Astor Place this fall. NOMAD — A Washington, D.C. pizza joint that offers free tattoos to employees and customers and puts local ingredients on its pies opened an eatery on West 28th Street in June, and has plans to open a second location at Astor Place this fall. 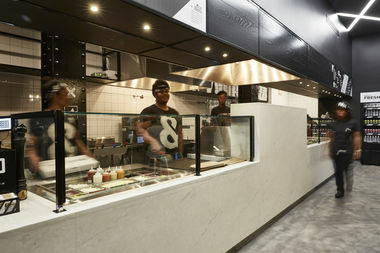 &pizza, which offers oblong-shaped pies for $11, opened its doors at 15 W. 28th St. near Fifth Avenue on June 20 and will open its second New York City location at 740 Broadway this fall, according to a company press release. And the first 23 customers at the Astor Place location will get free tattoos of the punctuation mark "&", as is custom when the company opens a new branch. The pizzeria allows customers to choose from toppings or nine signature pizzas like the "American Honey," that features a drizzle of Mike's Hot Honey, spicy tomato sauce, mozzarella balls, pepperoni, arugula, goat cheese and red pepper chili flakes. Customers can also tailor their drinks by mixing them, according to the company's website. Its soda fountain is called "Soda, Turnt" because you can craft flavors to your choosing using its house made sodas. Mike's Hot Honey, Luke's Lobsters and Milk Bar have partnered with &pizza under the company's program called "Little Giants." &pizza selects small, like-minded businesses to work with and feature their products. &pizza also calls itself an "anti-establishment" establishment that supports "living wage" and offers its employees — "tribe members" — full time work and at least $2 above the minimum wage at its locations across the nation, according to the company. Its founder, CEO and creative director, New York City native Michael Lastoria, picked the two new spaces based on their respective energies. "With its unique combination of rich history and vibrant, bustling modernity, the NoMad neighborhood is the perfect home for the inaugural NYC shop and will provide the city’s hungry crowds with a welcoming home for the dynamic &pizza experience," he said in a statement. "Our brand is fueled by energy, creativity and individuality — traits New Yorkers possess in excess. And Astor Place, with such a rich cultural history in the arts — AKA art street in the 1770s — has given us even more fuel and inspiration to draw from." Founded in 2012, the company has 22 stores across the country, including in D.C., Maryland, Virginia, Philadelphia and New York.